One thing that I love to do in the Fall is go to a Farmers Market to get fresh picked apples. Over the weekend my family did just that. We got a bunch of Honey Crips apples (my favorite) and we also got a 1/2 bushel of Ginger Gold apples so that I could make some homemade applesauce. So I searched for some different recipes because I wanted to try something new this year. I found this fabulous recipe from He and She Eat Clean. It was simple to make, but I recruited my little helper anyways! Peel apples and cut into quarters. Be sure to core apples well and get the seeds out. 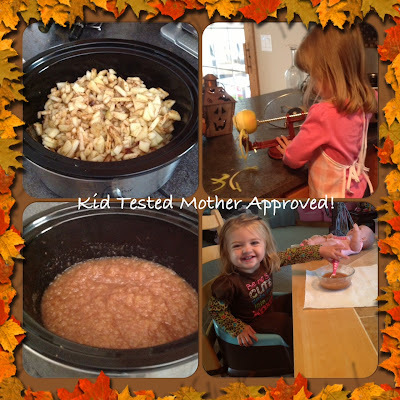 I used our apple peeler and chopped the apples into small pieces to be sure to avoid "chunky" applesauce, which I know my daughters do not like. Place apples into the bottom of the crockpot. Add lemon juice, water, cinnamon, nutmeg, maple sugar flakes, and pure vanilla extract to crockpot. Stir briefly - just enough to mix ingredients. Cook on low for 2 hours and then raise the temperature to high for 1.5 hours. Stir and mash any apple chucks. Caution: This will make your house smell WONDERFUL!